Hillary Clinton Comments On Torture, Insisting, "We Should Never Condone Or Practice It"
She's never been short on wisdom, and she certainly isn't on the subject of torture. While accepting an award at the Robert F. Kennedy Center For Justice and Human Rights on Tuesday, Hillary Clinton commented on torture and the revelations from the recent Senate Intelligence Committee report on the CIA's detention program. Clinton's remarks come right off the heels of a new Washington Post/ABC News opinion poll revealing the American people's opinions on the interrogation techniques used in the program. Judging by the results, the country needs to heed Clinton's remarks more than ever. According to the poll results, about 60 percent of Americans believe that the CIA's treatment of suspected terrorists was justified. More than half of Americans believe that the detention program was successful in producing important information, and more than half also felt that it was wrong for the Senate Intelligence Committee to issue a report that contradicts that. Perhaps most alarming is that nearly half of Americans agree that the interrogation techniques used amounted to torture — yet the majority still think it was justified. And only two out of 10 would entirely oppose using torture tactics in the future. These findings reflect a country still consumed by their fear of terrorism, a country that is miles away from the America that Clinton spoke of on Tuesday night. She described an America whose integrity would never allow it to resort to torture, an America that never wavers from upholding its values. It may very well be the America that she one day hopes to shape and lead. Take a look at Clinton's most powerful words on torture. Clinton hints at future administrations and urges whomever may be at the helm to never tolerate torture. Today we can say again, in a loud and clear voice, the United States should never condone or practice torture anywhere in the world, not under any future administration or in any future conflict. Clinton suggests new laws be written to further prevent and discipline the use of torture, which should be a nonpartisan issue. That should be absolutely clear as a matter of both policy and law, including our international treaty obligations, and if that requires new legislation, then Congress should work with President Obama to quickly enact it, and it should not be an issue of partisan politics. 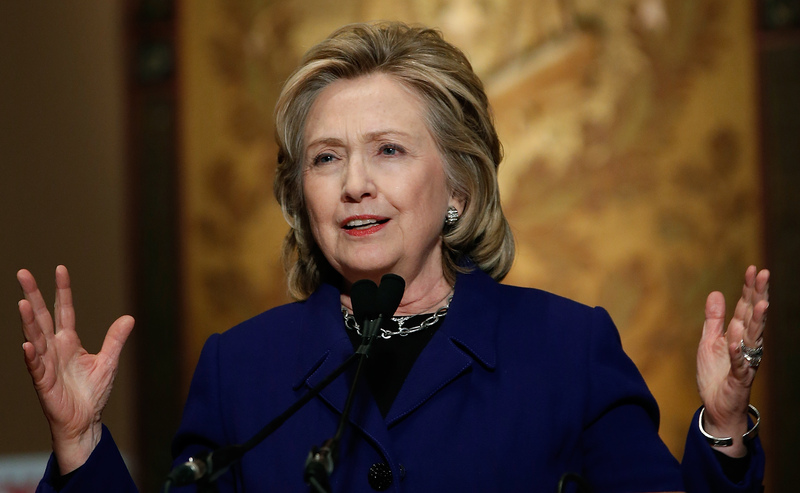 Torture is not the only way to stop terrorism, Clinton reminds us. In fact, torture was revealed to be ineffective. It is possible to keep us safe from terrorism and reduce crime and violence without relying on torture abroad or unnecessary force or excessive incarceration at home. The actions of our enemies are inhumane, but Clinton pleads that we don't lower ourselves to their level. Yes, the threat of terrorism is real and urgent, scores of children were just murdered in Pakistan, beheadings in the Middle East, a siege in Sydney, these tragedies not only break hearts but should steel our resolve and underscore that our values are what set us apart from our adversaries. Clinton describes the America she'd like to see. There's no doubt that at home and abroad, America is at our best when our actions match our values.